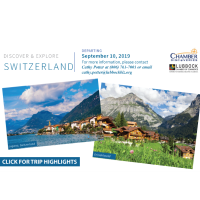 LUBBOCK, Texas – The Lubbock Chamber of Commerce has announced that it will be exploring Switzerland in 2019, and is inviting Chamber members and their family and friends to join this once in a lifetime experience. The trip will be an eight-day journey departing on Sept. 10, 2019. For more information about this amazing trip contact Cathy Potter at (806) 761-7001 or email at cathy.potter@lubbockbiz.org. Click here for more information or to book now!